New customers only. £10 min deposit. Bonus 100% up tp £100. Bonus wagering 35x in 30 days. Netller/Skrill/Paysafecard excluded. Game weighting and T&Cs apply. 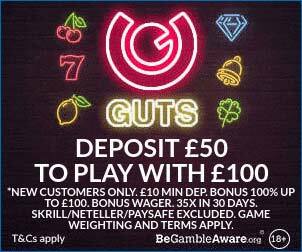 New players at Guts casino are eligible to claim a 100% matching bonus up to £100. The bonus is also eligible for 50 wager-free spins on the Book of Dead slot game (10 spins for each of the first five days after your deposits). • A minimum deposit of £10 is required to claim this bonus, using the bonus code PARTY. • Deposits via Neteller, Skrill or Paysafecard are excluded from this offer. • The bonus is 100% up to £100. • The bonus must be wagered x 35 before the funds can be withdrawn or played on other products. • The bonus and any winnings will be forfeited if wagering requirements have not been met within 30 days of the bonus being credited. • You can place a maximum bet of £5 per spin when you have the bonus active. • The 50 spins can only be used on our Book Of Dead slot, paid out at 10 free spins per day for five days – the winnings absolutely wager free. Slots* and other games 100%. All games under the "classic slots" tab 75%. All Live Dealer Roulette and black jack 10%. All Live Dealer Baccarat and Casino Holdem 5%. All table games and video pokers 0%. *Blood Suckers, Kings of Chicago and 1429 Uncharted Seas: 50%. • Only one bonus per person. • Guts standard and casino bonus terms and conditions apply. Existing players at Guts can claim a weekly reward on a Monday each week. NB Double Deal Monday extra spins can only be granted after the welcome bonuses have been used.